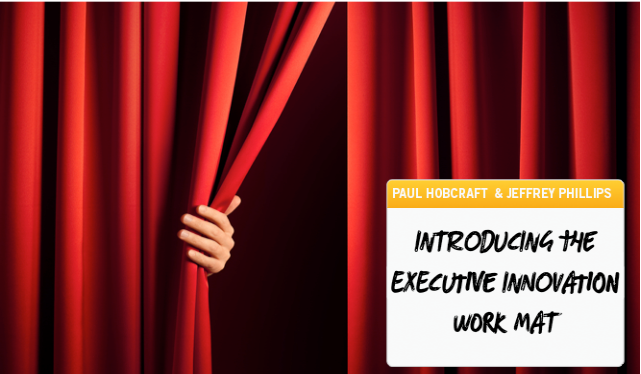 I’m right in the middle of a launch of the Executive Innovation Work Mat approach, a series of seven blogs outlining a framework and structured approach to this. 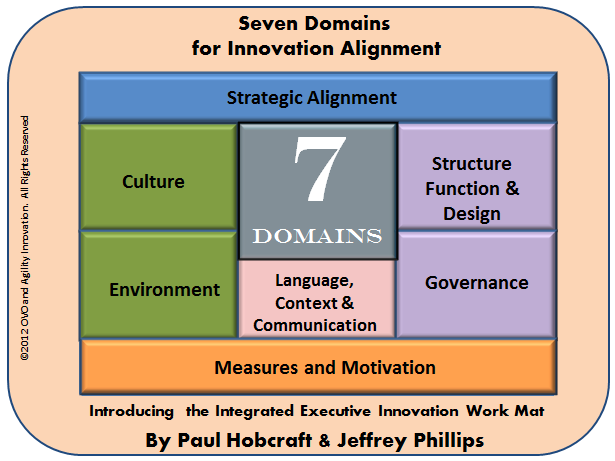 During the seven days these will document seven important “domains” that determine innovation success or failure. Each domain creates innovation potential, but sustained, successful innovation requires a unified “framework” in which all of these domains are appropriately engaged and aligned. The development of this framework, which we call the Executive Innovation Work Mat, is the responsibility of the CEO or senior executive. 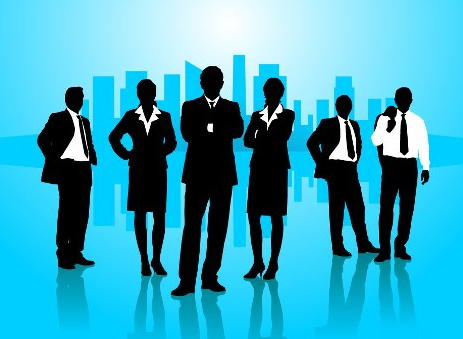 They can deliver alignment by engaging and providing this leadership required in innovation. 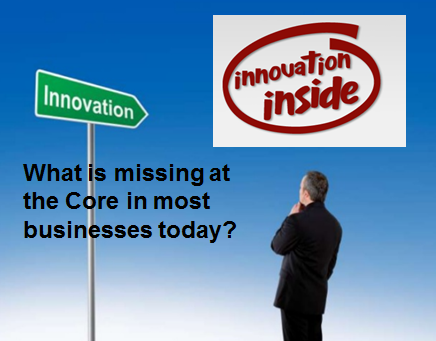 If you have the opportunity, do go over to the www.innovationexcellence.com site to see the first two blogs, the foundation document and whose role it is to design this and why. Seeking reactions, searching for the barriers and issues is critical. My reply was partly: You strike at the heart of the problem. Getting the senior business leader looking more towards innovation, it will happen as you say if one targets the wider community (investor and Shareholder) even the end customer voting with their feet. Thankfully survival is changing as tenure reduces and something will eventually ‘give’ to alter their risk appetite. In some ways we do not want to change their behaviour, more change their engagement and alignment to innovation that goes on. The link between strategy and innovation, if we can reduce this gap then it begins to ‘appeal’ to the leader as one less problem for greater utilization and tighter performance -which does play into their short-term performance mindset. If they can set the frameworks more, still stand back and make the necessary judgement calls then we have shifted the ground. If they engage even more and become more comfortable with increasing risk by increasing their understanding, again there is a real gain. My reply to Drew was: Drew, it is such a persistent problem, as we say, it has become a boil on the back of our neck, and it needs to be ‘lanced’. Of course there is so much to distract leaders, they are pulled in so many different directions but you don’t delegate growth, new wealth creation, your future to others. Presently many of our leaders simple do that! There is much work to be done, I call this the new work of this decade and this only comes through innovation. Leaders need to get it! In many ways this is the most disturbing, because Jack is right that across so many suggestions on innovation (good and bad alike) there does seem to be this absence of the industry practitioner themselves engaging and participating with their insights, knowledge or counter observation. I replied to Jack: “It is frustrating that the actual community that is working innovation stays silent on so many forums or discussions on innovation. Notable exceptions are where leaders of innovation initiatives have their own blogs or deliver ‘thinking’ pieces into some of the established innovation knowledge sites. I know many read the articles but feel often ‘constrained’ by who they work for and not feeling they can participate, even if the views expressed are theirs, or feel sometimes a little daunted entering into areas they feel they lack that broader experience, both constraints are a great pity. Perhaps the number of consultants or ‘experts’ drown out the voices from industries and often provide conflicting advice that can leave many simply confused, it is better to just get on with what you are doing. Equally they feel they don’t have the time or intellectual curiosity and simply just get (stay) within the bounds of what they can influence to apply their energies. Not an easy one to resolve”. The engagement that is required to make innovation happen is demanding. Deloittes Centre for the Edge has looked previously at the connections between passion and engagement and found that only 20% of the sample regarded themselves as “passionate” about their work. That begins to point to a lack of real engagement and just passive interest that seems to occur within many knowledge communities. Secondly there were marked differences in employees in large firms and those self-employed with higher scores of disengaged,and passive for firm employees. Unless the environments change in large organizations where the feeling of having a “safe place”, not always needing “permission” and one where people can “think out loud” and have “ownership”, not precise goals underwritten by tight measures but by suggesting “broader parameters” we might see a re-engagement, a reactivation and “sense of pride” but it lies in the hands of the leaders to construct this. Where those within the innovation community they need to push back up the organization a different view, one that offers a different “construct” to manage innovation. We are trying to offer that thinking through this present series and in the final framework we are suggesting. Why Jeffrey and I feel you need an integrated innovation framework approach as we are outlining this week, is critical to innovations long term sustaining future, let alone the immediate term of boosting quarterly results so often the judge of organization effectiveness and management. Turning prisoners from being captive within organizations into “partners, collaborators and champions” that grow in their identity with what innovation provides to the cause and mission of the organization, is powerful. It unleashes much. Why do I call them prisoners? 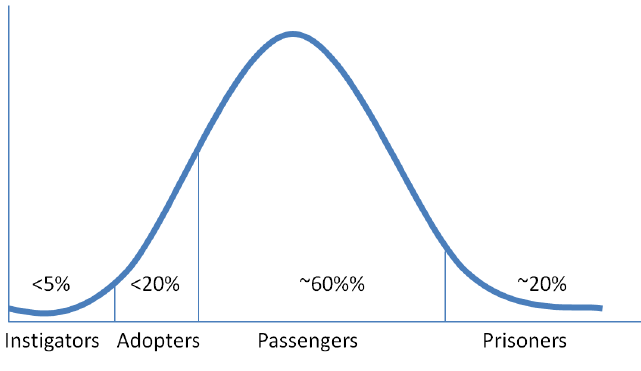 The challenge it is suggested, in rather same way as Malcolm Gladwell discusses in ―Tipping Point, is to enable the ―instigators, enthuse the ―Adopters and convert a good number of the ―Passengers to ―Adopters. Prisoners may be more problematic and longer term issues. So will we get the adopters to “push” the Executive Innovation Work Mat and gain conversions, not just in colleagues who would like to get more engaged but find the way to place this series of blogs under the noses of the leaders, that all crave for improving innovation performance but perhaps did not recognize the essential role they should play? We hope we can say “welcome on board” and “sit back, buckle up and enjoy the ride” to many within the innovation community and we can achieve a better all-round service performance because the leaders of our organizations finally do get to understand their role to play in the innovation sphere, as outlined in the Executive Innovation Work Mat series. A role that can help unlock all those prisoners that are currently residing within organizations, who can offer so much more, if they are given the encouragement and the organizing framework to guide them back into being engaged employees seeing innovation for what it is, a place for identification and pride. ensure defined innovation processes and metrics exist so innovation is sustainable.